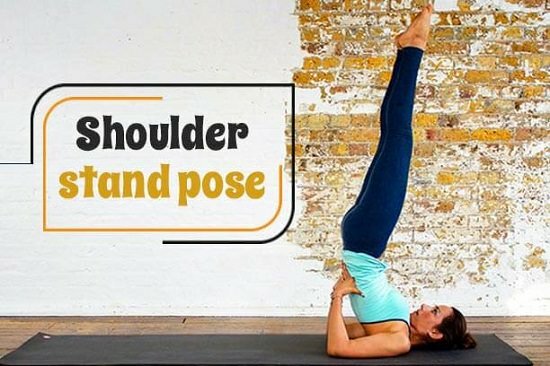 Improve your fitness and achieve the best shape ever with these 29 Best DIY Yoga Poses for Weight Loss in this article! The Plough pose engages muscles of the torso and pelvis to melt away extra pounds and help attain a streamlined body. Follow the instructions here. The triangle pose is an energizing asana that strengthens your chest and limbs, thereby improving breathing capacity and metabolism. The video tutorial is here. The cobra pose reduces stiffness in the back and firms buttock muscles, giving you a more aligned shape. Check out the video tutorial here. The child’s pose reduces fatigue and stress by relaxing muscles of the thigh, hips, and limbs. Simply repeat these instructions. The crow pose increases balance and focus, by strengthening your arms and relieving pent-up tension in the back. Visit very well fit for the steps. The shoulders and pose firms saggy skin on the back, hips, and tummy while activating the gut muscles to digest food faster. Instructions are here for you to follow. The Bow pose strengthens the back and abdominal muscles simultaneously, enhancing the rate of digestion and energy flow to your core. Get more details on this pose here. The half-spinal pose has wondrous benefits, including the prevention of diabetes, constipation relief, and migraine elimination. Watch the steps in this tutorial video. Known to bridge the gap between mind and body. The bridge pose is a deeply rejuvenating pose that opens up the heart chakra and makes you feel grounded into the reality. You can do this pose while watching the steps here. The chair pose may work with the limbs but actually strengthens the heart and improves lung capacity, helping you exercise longer than usual. Repeat this pose with the help of this video. The side plank pose stretches the arms and tummy, helping you get a flatter belly. This video tutorial will aid you in doing it. Inspired by Lord Shiva’s dance, this spiritually elevating yoga pose is known to tone thigh and buttock muscles while enhancing connection with the cosmos. Get guidance from this post. The Warrior III pose sends stimulating sensations from the waist down to the limbs and is mostly done to relieve mental tension. Know more here. This yoga pose tones the abdominal muscles and helps fight thigh cellulite. Click here to learn this yoga pose. Revered as the icon of the spiritual sufferer, this yoga pose strengthens the flexor and extensor muscles of the limbs, improving gait and balance in the process. Yoga Journal has more details on it. The back-bending pose releases tension in the spinal cord while firming sagging bust tissue. The detailed version is here. The locust pose strengthens gut muscles, increasing bodily metabolism, and digestion, thereby aiding in weight reduction. Here is how to do it! This pose is perfect for people who want to improve their gait and bring grace to their body. Repeat the steps from this tutorial. The plow pose stretches your spinal cord and reduces the back pain, helping you sleep well. Get the necessary instructions in this video. The classic headstand pose improves blood supply to the brain and restores focus and clarity. The safe way to do this pose is here. This yoga pose is great for relaxing the back muscles and getting relief from flatulence. Follow this post for instructions. The revolving lung pose is known to activate the third chakra in the solar plexus, which is responsible for proper metabolic functioning and increasing vitality. See more about it here. The tree pose maintains body balance, opening your mind to newer, positive thoughts and improving focus for the day. Learn more by visiting art of living. Boat pose tightens tummy muscles, making it perfect for negating stretch marks and saggy cellulite. To learn this pose click here. The half moon strengthens your limbs, and relieves stress and depression, especially if you incorporate the head-swinging step. Get inspiration from here. 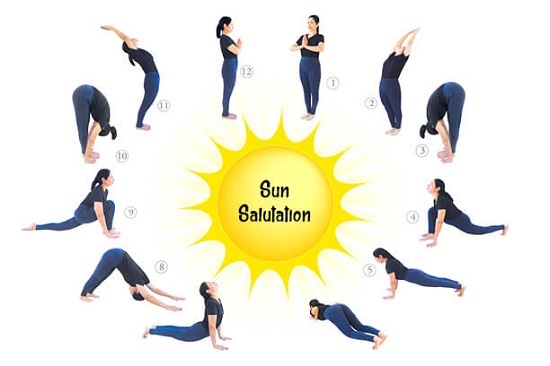 Besides pronounced benefits on cardiovascular health, sun salutation poses induce positivity and alertness. All the poses are here. This frog pose, grounds you with your inner core, improving blood circulation in the limbs and releasing muscle tension. Here’s the source of this video tutorial. Tone your ab muscles and loosen pelvis muscles with this easy yoga pose. Replicate this pose by watching this tutorial. This yoga pose strengthens back muscles and releases pent-up tension in the legs. The steps to perform it are here.